1. 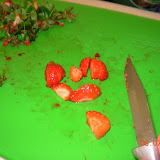 Mix crushed and quartered berries with sugar in medium bowl; set aside while preparing biscuits (or up to 2 hours). 2. Adjust oven rack to lower middle position; heat oven to 425 degrees. Mix flour, salt, baking powder, and 3 tablespoons sugar in medium bowl. Using large holes of box grater, grate butter into dry ingredients, (see illustration 2). Toss butter with flour to coat. Use pastry cutter to finish cutting butter into flour. Or scoop up coated butter with both hands, then quickly rub butter into dry ingredients with fingertips until most of butter pieces are size of split peas. 3. Mix beaten egg with half-and-half; pour into flour mixture. Toss with fork until large clumps form. Turn mixture onto floured work surface and lightly knead until it comes together. 4. Pat dough into 9- by 6-inch rectangle, 3/4 inch thick. Flour 2 3/4-inch biscuit cutter; cut 6 dough rounds. Place 1 inch apart on small baking sheet; brush dough tops with egg white and sprinkle with remaining sugar. (Can be covered and refrigerated up to 2 hours before baking.) Bake until golden brown, 12 to 14 minutes. Place baking sheet on wire rack; cool cakes until warm, about 10 minutes. 5. Chill nonreactive, deep, 1- to 1 1/2-quart bowl and beaters for a handheld mixer in freezer for at least 20 minutes. Add cream, sugar, and vanilla to chilled bowl; beat on low speed until small bubbles form, about 30 seconds. Increase speed to medium; continue beating until beaters leave a trail, about 30 seconds more. Increase speed to high; continue beating until cream is smooth, thick, and nearly doubled in volume, about 20 seconds for soft peaks or about 30 seconds for stiff peaks. If necessary, finish beating by hand to adjust consistency. (Can be transferred to fine sieve or strainer set over measuring cup and refrigerated up to 8 hours). 6. Split each cake crosswise; spoon a portion of berries and then a dollop of whipped cream over each cake bottom. Cap with cake top; serve immediately. 1. For best taste and appearance, crush one-third of the berries. 2. Grating frozen butter into the flour makes for easy mixing. 3. Split biscuits by hand before adding strawberries.